● mS/cm (Milli-siemens per centimeter) - often abbreviated as “mS”. ● µS/cm (Micro-siemens per centimeter) - often abbreviated as “µS”. ● ppm* (parts per million) or mg/L (milligrams per litre). Both these have the same numeric value. These are the units for “total dissolved salts” (TDS). EC meters that provide these units have internal software that mathematically convert conductivity readings into a TDS estimate. However, this estimate is prone to many errors and therefore its use should be avoided. To utilize conductivity recommendations, the grower first needs to know what ‘units’ the meter operates in e.g. mS/cm, cF. This will be displayed on either the digital display or stamped on the body of the meter. Some brands offer multiple options such as cF, mS and µS. If this is the case, choose the option that matches that used by the recommendation. For example, if your local growshop recommends to maintain the nutrient solution at 2.2mS, then switch the meter to read “mS”. 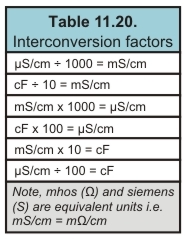 If the meter does not provide the units specified in the conductivity recommendation then it will need to be manually converted (see Table 11.20). For example, if the recommendation is 2.2mS and the meter only works in cF, convert the recommendation to cF by multiplying it by 10. i.e. 2.2mS x 10 = cF 22. Conversion chart: For converting EC values to "ppm" for Hanna, Truncheon or Eutech TDS meters.